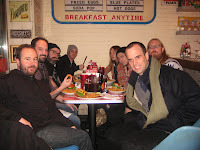 My friends Tim and Chris from Blood Company were in town with their bands Norma Jean and HORSE the Band and wanted to meet up with burger conquester Leo and I, as well as Rich Hall from 1000 Knives for a pre-show meal. Rich says “I can eat a burger” and I think you know where the story goes from here. 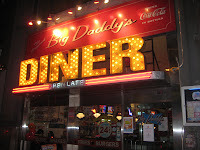 As the show was in the Gramercy section of Manhattan, I naturally chose the Gramercy Park location of Big Daddy’s Diner for our burger conquesting pleasures. All the burgers come served on fresh brioche bun and a side of cole slaw and pickles. You also get your choice of french fries or tater tots and if you know what’s good for you, you get tots! While I was severely tempted by the “Daddy-O” burger with jalapeno jack, thick cut bacon & crispy onions and the “Dude” Burger with thick crispy bacon, caramelized onions, avocado, lettuce, tomatoes, and special maytag bleu cheese dressing, I went old school; “All American Burger 102,” a half-pound burger with cheddar and lettuce. While Big Daddy’s Diner seems to be off the Burgeratti radar, I walked in with no expectations and ended up with a pretty decent and juicy burger. My one issue, and it’s a BIG ONE, cold tots. Way to ruin my favorite burger companion. 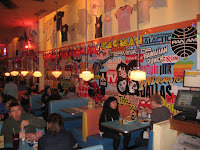 If you are going to check out Big Daddy’s Diner, be sure to sign up for their “Insider’s Club” first. Much like we did, you will get 15% off your entire bill! 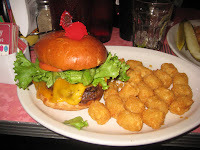 This entry was posted in Burgers, Hamburgers and tagged bar, best burger, best burgers in nyc, Big Daddy's Diner, burger blog, burger club, burger conquest, cheese, ciancio, david, french fries, gourmet burger, Gramercy Park, great burger, hamburger, nyc, restaurant, rev, review. Bookmark the permalink. Im gonna go with Rev on this review, entirely. Good burger, good bun, fresh vegetables… but cold tots. 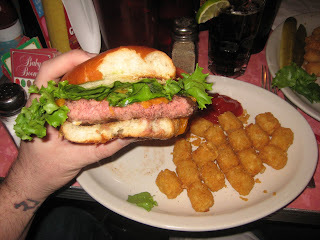 Also sticking with the standard cheeseburger medium rare for my order I have to say I was pleasantly surprised with the quality of this diner burger. Not one of my tops in the city, but definitely good enough to warrant a repeat visit when needing a burger on that block.